CHURCHILL, WINSTON S. (1874-1965). British statesman and author; prime minister from 1940-45 and 1951-55. SP. (“Winston S. Churchill”). 1p. Oblong 12mo. 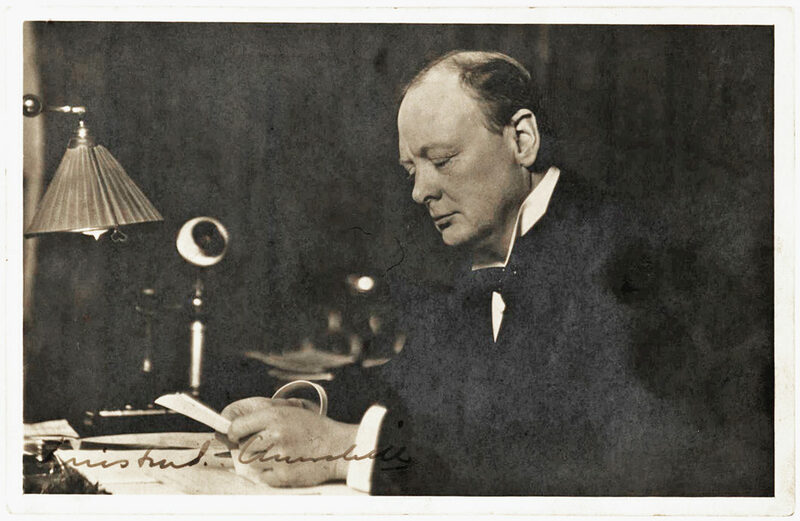 N.p., N.d. A black-and-white postcard photo depicting Churchill seated at his desk reading a letter. 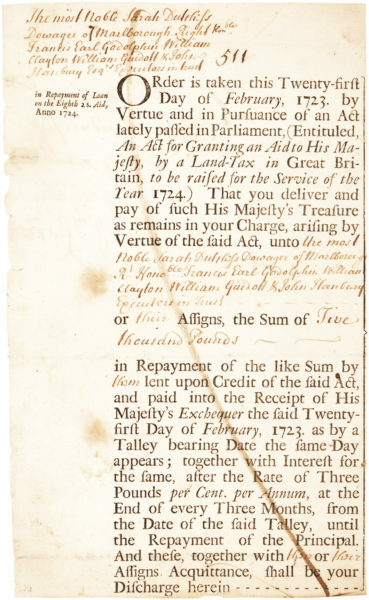 Signed in the lower left portion of the image. According to Marc Kuritz, a leading dealer in Churchill material, the original photograph was taken by Walter Thomas, circa 1915, when Churchill served as First Lord of the Admiralty, a position he was to resign that year following the disastrous Dardanelles campaign. The identical image was later used on the 1933 first printing of the Eyre & Spottiswoode edition of Churchill’s The River War. Before his career as a statesman, Churchill was a soldier and a reporter, covering Cuba’s fight for independence from Spain for London’s Daily Graphic. Indeed it was his own journalistic account of his exploits of rescuing an armored train from a Boer ambush along with his subsequent escape from a South African prison that made him a hero and led to his election to parliament in 1900, beginning a life-long political career. Churchill served as home secretary and, famously, First Lord of the Admiralty before resigning from the Liberal Party and being elected a Conservative MP in 1924, the same year that the party’s leader, Stanley Baldwin, appointed him Chancellor of the Exchequer. In that post Churchill returned Great Britain to the gold standard, which led to increased unemployment and a growing unpopularity that culminated in his 1929 election defeat. Although out of office for the next ten years, he remained active in public life and became prime minister in 1940. He is revered for his leadership during the London Blitz and World War II, characterized by his famous “Blood, Toil, Tears and Sweat” speech, his first address to Parliament. Churchill was soundly defeated in the 1945 election, but the elder statesman refused to retire and continued to champion the cause of British security and world peace. During this interregnum Churchill began his six-volume history, The Second World War, gave his famous “iron curtain” speech in 1946, and attended the first assembly of the Council of Europe in 1949. Though defeated a second time in 1950, he was victorious in 1951 and once again took the position of Prime Minister until poor health prompted his resignation in 1955. He remained a Member of Parliament until 1964, a year before his death. 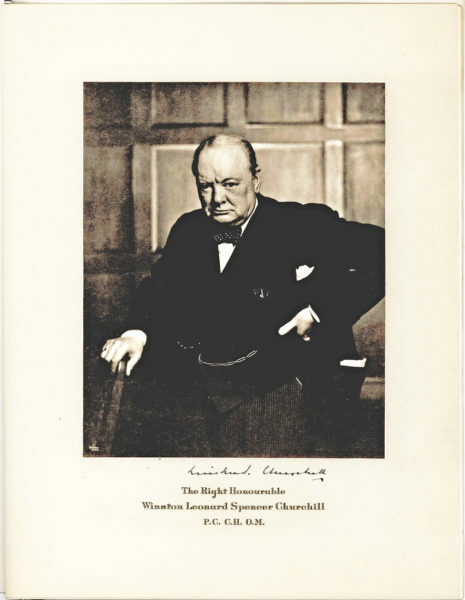 Some of Churchill’s other works include A History of the English Speaking Peoples and the multi-volume biography of his famous ancestor, Marlborough: His Life and Times. 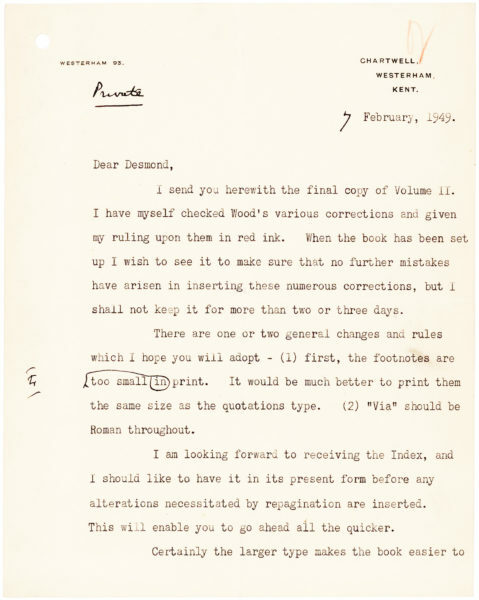 His books earned him the 1953 Nobel Prize for Literature “for his mastery of historical and biographical description as well as for brilliant oratory in defending exalted human values.” Accompanied by an envelope stating that the photograph was given to Eustace C. Larke after he wrote a letter complimenting Churchill on his Marlborough book. Some slight silvering to the image, otherwise near fine.